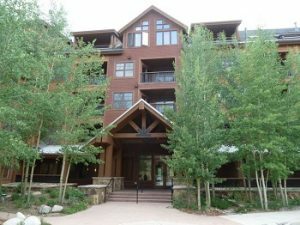 Springs at River Run Condo is steps from the gondola in Keystone Real Estate. These ski in ski out River Run condos in Keystone CO were built in 2000. There are 94 units consisting of 1 – studio, 23 – one bedrooms, 54 – two bedrooms, 13 – three bedrooms and 3 – four bedroom units. Springs at River Run Condos have spacious decks with either views of the ski area, the seasonal creek or down valley mountain views. Out of all the lodges in River Run, Springs at River Run Condos have some of the best amenities. Those include an outdoor heated pool with a slide, hot tubs, lobby with lounge area, pool table and fireplace, fitness room, sauna, movie room, ski lockers and more. There is also an underground parking garage with unassigned parking. Springs at River Run Condo may be the right fit for you and your family with the vast array of amenities, proximity to the slopes and all the entertainment, shopping and dining of River Run steps away. Arrange a showing of Springs at River Run Condo and other River Run condos for sale in Keystone Real Estate with Justin and Krystal Knott of LIV Sotheby’s International Realty.